TRINKOT, Afghanistan, Nov. 2 (Xinhua) — The government forces, after three days of fierce fighting and killing some 80 militants, have foiled Taliban attempts to overrun Uruzgan’s provincial capital Trinkot, a key city in Afghanistan’s southern region, provincial police chief Wali Jan Sarhadi said Wednesday. “Operations against Taliban rebels which begun three days ago have left around 80 insurgents dead and injured almost 80 others around provincial capital Lashkar Gah,” Sarhadi told Xinhua. 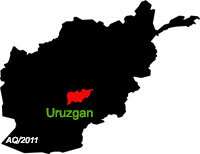 The government forces have recaptured Charmgar and Sarshakhlo areas, forcing militants to flee, the official asserted. Charmgar neighborhood, according to locals, is some 2 km away from the Provincial Governor House in Trinkot and Sarshakhlo is just few hundred meters away from the Police Headquarters in Trinkot city. “By expelling the Taliban rebels from Charmgar and Sarshakhlo localities, the security threats on Trinkot has been zeroed,” Sarhadi said, adding the security forces are in control of the situation. During the ongoing operations, huge quantity of arms and ammunitions including four suicide vests have also been seized, the police chief added. Taliban militants who had already been pushed back from around Helmand’s provincial capital Lashkar Gah, a key city in southern region and have been fighting tooth and nail in some more provinces, haven’t commented on the situation in Trinkot. Moreover, the Uruzgan police chief Sarhadi told Xinhua that the government forces would soon launch major operations against militants in Gezab and Chari districts, the two Taliban bastions in the Uruzgan province. Meantime, lawmakers in Wolesi Jirga or Lower House of parliament, in their session on Monday questioned government’s war strategy and claimed that the security leadership has not enough potential to lead the war against insurgents.